Granita is a little bit like a homemade slushy. 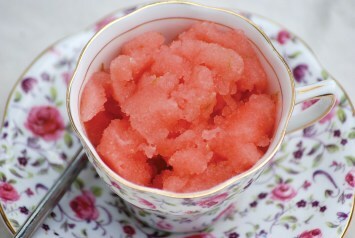 This watermelon and lime flavored granita recipe is perfect for hot summer days. Serve it any time you want a cool down. Note: You will need an ice cream maker for this recipe. Before going a step further, pick through the cubed watermelon and remove any visible seeds. Yes, even seedless watermelon has seeds; it has to reproduce somehow. Now, place 2 cups of the watermelon and 1/4 cup water into your blender and whir away. Pour the pureed watermelon into a large bowl (at least 4-cup capacity) and repeat with the remaining 2 cups of watermelon and another 1/4 cup water. Add the sugar, lime zest, and lime juice to the watermelon mixture. Stir to dissolve the sugar completely, then cover the bowl and refrigerate it until the watermelon mixture is chilled, at least 2 hours and up to 24 hours. Once the mixture is good and chilly, process it in an ice cream maker according to the manufacturer’s instructions. Transfer the now-frozen concoction to an airtight container, and freeze for an hour to allow the mixture to fully set. 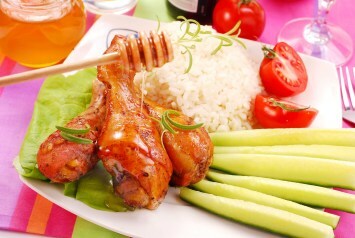 Perfect after any meal especially after eating picnic fare, or barbecue. It’s a great summer dessert to serve at barbecues. Or, it take along on a picnic if you have a cooler and lots of ice packs. One of the quintessential tastes of the summers of my childhood was – no, not watermelon, I’m afraid – a certain tart hard candy that was sold by the shovelful at the snack bar of the pool my family frequented. While I won’t bore you now with a rant about the nutritional value of said candy, I will say that this granita will bring you back to those sun-kissed, warm-breezed, poolside days of your youth. Try it and tell me I’m wrong. This recipe is easy, inexpensive and made with love. Better than snack shack treats any day. If you like this recipe, I’d love you to Pin it to Pinterest, Tweet about it, Like it on Facebook. Add your own recipes and comments below. This granita recipe is one of our cool down treats that are an essential part of outdoor living. Find our outdoor living recipes here.